Today, is part two of my look at the history of Technicolor through 10 scenes in classic movies. 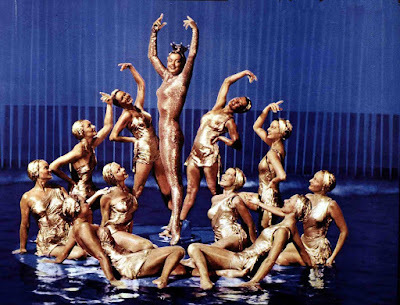 Here's Esther Williams and company in the spectacular Technicolor film, Million Dollar Mermaid (1952). If you need a refresher on the history of Technicolor and the first five films I featured, you can go to Part One. Otherwise, we'll jump right in to the postwar era, which was the golden age of Technicolor. The popularity of Technicolor coincided with the rise of film noir in the mid 1940s. While most noir filmmakers preferred the shadows and low-key lighting provided by black and white cinematography, there are a few color noirs. Director John M. Stahl's Leave Her to Heaven (1945), starring Gene Tierney as an unstable femme fatale who ruins the life of a writer played by Cornel Wilde, used Technicolor in much the same way many noir directors used black and white. The clip below is the film's most famous scene, shot at Bass Lake in the High Sierras. Stahl and cinematographer Leon Shamroy (who won a Best Color Cinematography Oscar) contrast the beautiful scenery and the gorgeous Tierney (She, Vivien Leigh, and Maureen O'Hara are the screen's great Technicolor beauties) with her cruel and twisted actions. The greatest Technicolor films were actually made in the United Kingdom by directors Emeric Pressburger and Michael Powell. The men, who were collectively known as The Archers, began using color photography after Natalie Kalmus, the ex-wife of Technicolor inventor Herbert Kalmus, arrived in England. Natalie was a Technicolor technical adviser for many old Hollywood movies, but her straightforward manner and perfectionism irritated many producers; in fact, David O. Selznick once kicked her off Gone With the Wind for insisting that a Twelve Oaks set by re-painted. The Archers treated Technicolor as an art form, and in the late 1940s they made three Technicolor masterpieces: A Matter of Life and Death (1946), Black Narcissus (1947), and The Red Shoes (1948). All three films deserve a place on this list, but both Herbert and Natalie Kalmus considered The Red Shoes the greatest Technicolor movie ever made, so here's the Swan Lake scene. Westerns, with their sweeping outdoor vistas, were ideal for Technicolor. One of the first successful Technicolor movies was Trail of the Lonesome Pine (1936) starring Henry Fonda and Fred MacMurray, and two successful Technicolor Westerns -- Dodge City and Jesse James -- were released in 1939. The great Western director John Ford began using Technicolor after World War II. Ford's favorite shooting location was Monument Valley, located in Arizona and Utah. The American Southwest looked spectacular in Technicolor as you can see in this clip from She Wore a Yellow Ribbon (1949), featuring John Wayne in one of his best performances as retiring cavalry officer, Nathan Brittles. Television began to dominate American life in the 1950s, so the Hollywood studios began churning out Technicolor spectacles to lure audiences away from their newfangled TV sets. Biblical epics like Samson and Delilah (1949) and Quo Vadis (1951) packed the theaters, but Technicolor's No.1 star was swimming sensation Esther Williams. Director Busby Berkeley choreographed many a spectacular Technicolor number, but he outdid himself with this clip from Million Dollar Mermaid (1952). The studios began to turn away from Technicolor in the early 1950s when Eastman Kodak introduced inexpensive color film. Many cinematographers and art directors felt that Eastmancolor was inferior to Technicolor, but the penny-pinching studios forged ahead with the transition. Still, some filmmakers, like producer/director George Pal, continued to use Technicolor. The menacing Martians in Pal's 1953 science fiction epic The War of the Worlds wouldn't have been quite so terrifying without the rich, saturated colors of Technicolor film. Leave Her to Heaven: DVD. The Red Shoes: Streaming on Watch TCM until July 14. Also available on DVD and video on demand. She Wore a Yellow Ribbon: Airing at 8 p.m. July 8 on TCM. DVD and video on demand. The War of the Worlds: Netflix Instant, DVD and video on demand.